Amazon is fast becoming a crucial marketplace for tools and home improvement brands. In fact, One Click Retail recently catalogued a 25% year-over-year growth rate for tools and home improvement sales on Amazon. For context, that was more than 3X the growth rate of The Home Depot over the same period. Tools and home improvement brands need to address any critical gaps in their product content on Amazon in order to take advantage of this growth and outflank competitors. Our latest report, The Winning Elements of Amazon Tools and Home Improvement Pages, analyzed more than 335,000 product pages live on the ecommerce giant within the tools and home improvement category. We used the Amazon Sales Rank of each product to determine top performer and poor performer averages. To provide additional clarity and guidance, we split up the analysis by price ranges, and outline recommendations based on tactics employed by top-performing products within those price points. 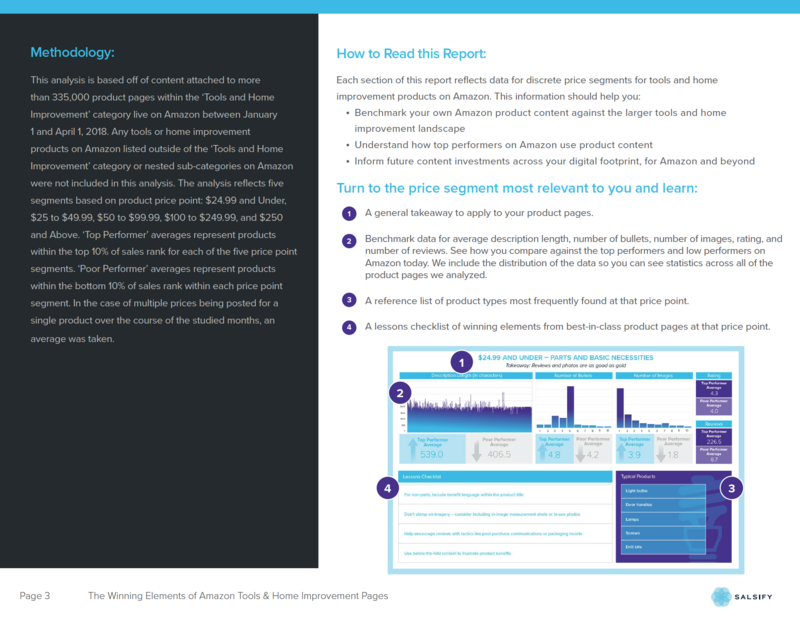 Use this report and the data within to evaluate your product content on Amazon. Successful brands are speaking to their prospective customers with engaging content, in a way that takes into account Amazon’s algorithm, unique user experience, and shopper journey. The analysis reveals how important images and reviews in particular are for attracting buyers in the tools and home improvement category. Top performing product pages across every price point have substantially more images and reviews on average, as compared to poor-performing pages at the same price point. Get the full set of data, including the tactical recommendations, to better prepare your strategy for the remainder of 2018 and beyond.